Objectives There is an urgent need to understand how to improve targeting of artemisinin combination therapy (ACT) to patients with confirmed malaria infection, including subsidised ACTs sold over-the-counter. We hypothesised that offering an antimalarial subsidy conditional on a positive malaria rapid diagnostic test (RDT) would increase uptake of testing and improve rational use of ACTs. Methods We designed a 2×2 factorial randomised experiment evaluating 2 levels of subsidy for RDTs and ACTs. Between July 2014 and June 2015, 444 individuals with a malaria-like illness who had not sought treatment were recruited from their homes. We used scratch cards to allocate participants into 4 groups in a ratio of 1:1:1:1. Participants were eligible for an unsubsidised or fully subsidised RDT and 1 of 2 levels of ACT subsidy (current retail price or an additional subsidy conditional on a positive RDT). Treatment decisions were documented 1 week later. Our primary outcome was uptake of malaria testing. Secondary outcomes evaluated ACT consumption among those with a negative test, a positive test or no test. Results Offering a free RDT increased the probability of testing by 18.6 percentage points (adjusted probability difference (APD), 95% CI 5.9 to 31.3). An offer of a conditional ACT subsidy did not have an additional effect on the probability of malaria testing when the RDT was free (APD=2.7; 95% CI −8.6 to 14.1). However, receiving the conditional ACT subsidy increased the probability of taking an ACT following a positive RDT by 19.5 percentage points (APD, 95% CI 2.2 to 36.8). Overall, the proportion who took ACT following a negative test was lower than those who took ACT without being tested, indicated improved targeting among those who were tested. Conclusions Both subsidies improved appropriate fever management, demonstrating the impact of these costs on decision making. However, the conditional ACT subsidy did not increase testing. We conclude that each of the subsidies primarily impacts the most immediate decision. While the overwhelming view from the literature is that availability of subsidised ACTs quickly and effectively increases access, studies have demonstrated poor targeting of antimalarial drugs to malaria cases and overuse of ACTs in the retail sector. Evidence regarding use of RDTs in the retail sector, whether subsidised or unsubsidised, shows adherence to the results is inconsistent. This is the first study that makes an ACT subsidy conditional on diagnostically confirmed malaria infection, and provides new guidance to policymakers on consumer-directed subsidy programmes for malaria diagnosis and treatment. Our results show that both RDT and ACT subsidies can independently improve individuals' choices about malaria testing and treatment, demonstrating the price sensitivity of these decisions. Adding a conditional ACT subsidy to the RDT subsidy did not increase testing likelihood, but paying for an RDT does correlate with increased adherence to the RDT results. Information from an RDT can improve targeting of ACTs among those seeking treatment over-the-counter. RDT subsidies at the community level greatly improve uptake of diagnostic testing. Reducing the price of an RDT is critical for improving testing before treatment outside of the formal healthcare sector. ACT prices under the current government subsidy are still too high to ensure that all malaria-positive cases can afford treatment. However, conditional subsidies linked to a positive test may be more sustainable and improve ACT targeting compared to unrestricted subsidies. In 2010, The Global Fund introduced subsidised artemisinin combination therapy (ACT) to the retail sector of eight pilot countries in order to improve access to effective, first-line therapy for the millions of suspected malaria cases that seek treatment over-the-counter.1 In Kenya, the retail price of ACT dropped by 78% and the market share of ACTs increased from 12% to 61%2 as a result of the programme. Subsidised ACTs have now become widely available in the retail sector in many malaria endemic countries. However, there is concern that dramatically lowering the price of ACTs opened the door to overtreatment and overuse.3 Very few of the millions of suspected malaria cases treated in the retail sector receive a diagnostic test. This leads to poor targeting of ACT as demonstrated by studies in Tanzania and Uganda which documented that individuals without malaria purchase 66–80% of subsidised ACTs, while 70% of those with malaria do not purchase an ACT.4 ,5 This mismatch between who needs an ACT and who takes an ACT highlights the importance of expanding testing before treatment to reach those who purchase ACTs over-the-counter. Here, we sought to study the relationship between a subsidised diagnostic test and a conditionally subsidised treatment intervention in order to understand how ACTs can be targeted to malaria cases in the retail sector. We designed an individually randomised experiment to determine the effect of a conditional subsidy for ACT on the decision to be tested for malaria when the test is subsidised or not, and the subsequent effect of the test on drug purchasing decisions. Our primary hypothesis was that clients who learn they will receive an ACT subsidy conditional on a positive test are more likely to opt for testing before deciding which drug to buy. Secondary end points include the effect of the diagnostic test subsidy on uptake of testing, and the effect of testing and antimalarial subsidy on subsequent drug purchasing decisions. We conducted a 2×2 factorial randomised experiment to test two levels of subsidy RDT for malaria (fully subsidised and free to the participant vs an unsubsidised test for which the participant paid ∼US$0.50) and two levels of ACT subsidy (current retail price equivalent to no additional subsidy vs an additional subsidy of US$0.60 at the point of sale) on testing and treatment decisions of patients ill with malaria-like symptoms. The study was conducted in a rural division of Bungoma County in western Kenya. Over the course of the study period, from July 2014 to June 2015, 3 of the 11 sublocations in the eastern part of Bungoma subcounty were randomly selected for participation. In each of these sublocations, field teams canvassed in every household to identify eligible participants. Individuals were eligible for enrolment if they were older than 1 year and had a malaria-like illness or history of symptoms during the last 24 hours. Any individual who had already taken or purchased medicine or sought treatment for their illness was excluded. Anyone exhibiting danger signs, symptoms of severe disease or other problems requiring immediate referral to a health facility were also excluded and referred to the nearest facility with the help of the local community health worker (CHW). If more than one individual was found to meet the inclusion criteria in a single household, all of the individuals were enrolled in the same study group, but only one individual (selected by alphabetical ordering of their given names) provided information for the analysis. Participants gave verbal informed consent for entry into the study. Written informed consent was obtained for those who chose to have an RDT after enrolment. Parent or guardian consent was required for participants <18 years and child assent was required for children older than 8 years. Thirteen shops that sold medicines were identified within the communities from which participants were enrolled. Any shop that stocked WHO prequalified (green-leaf branded) ACT was eligible to participate in the study. Shops gave written consent for participation. We randomly assigned half the participants to receive a fully subsidised (free) RDT test, relative to the price of ∼US$0.50 that other participants would have to pay. Orthogonally, we also randomly assigned participants to one of two levels of ACT subsidy (current retail price including subsidies from government equivalent to ∼US$1.25 per adult dose, vs a further subsidised price of ∼US$0.65 per adult dose which was only available following a positive RDT). The ACT subsidy levels were chosen to compare the prevailing retail price under partial government subsidy to the previous highly subsidised Affordable Medicines Facility-malaria (AMFm)s price.2 Study participants were randomly allocated to the four groups in a ratio of 1:1:1:1 (figure 1) using scratch cards. CONSORT diagram of participant enrolment, refusal, group assignment and follow-up. The intervention available to each group (A–D) in this factorial experiment is detailed at the bottom of the diagram. Prior to initiation of enrolment in each sublocation, 20 CHWs from each sublocation attended a 3-day training programme to learn how to perform malaria RDTs. After consenting, the participant was offered a scratch card that had a group assignment to be revealed by the participant. The research assistant explained the individual's group assignment and that the period of validity for the CHW RDT testing was 3 days. The group assignment identified which of the two subsidies (one, both or neither) the participant was entitled to, but the participant was free to choose whether or not to seek testing or treatment regardless of their group assignment. Contact information for the nearest CHW was provided, but fieldworkers avoided health education messages about the intervention. All participants could obtain an RDT (free or US$0.50, depending on the group) by reporting to the CHW, who provided the conditional ACT voucher when applicable. RDT-negative participants or those not tested could still access ACTs at the normal retail price. Participants could also choose to seek care at the nearest health facility where they would be treated according to normal patient protocols. Government facilities charged US$0.65 for a microscopy test but ACTs are free. The voucher was redeemable at participating local drug shops. Eleven shops were enrolled in the study and remained active throughout participant recruitment. The only WHO ‘green-leaf’ branded ACT available in the retail sector in Kenya at the time of the study was artemether–lumefantrine (AL), which is also the first-line therapy used in the formal health sector. Therefore, the study voucher could only be used for purchase of green-leaf branded AL. Fieldworkers collected participant data at the time of enrolment and each participant was visited 1 week after enrolment to record information about action taken for the illness. Data were collected on Android tablets using customised electronic forms. CHWs recorded information about clients who requested an RDT on standard forms, which were scanned and digitised using a web-based automated data capture system (Captricity, Oakland, California, USA). CHWs regularly provided used RDTs to a field supervisor, who checked the recorded results against the RDT to make sure the CHW correctly interpreted the test. Treatment seeking for an acute illness in our study can be conceptualised as a series of steps and decisions: (1) decision to use RDT, (2) receive information from a test (positive or negative) and (3) decision to use ACT. The study intervention acts at steps one and three by allocating participants to different subsidy levels. Randomisation occurs before step one. Although group assignment includes the ACT subsidy assignment, participant groups are no longer randomly distributed on reaching step three since some will have opted not to be tested. Study end points are measured at multiple decision points of the health-seeking process. Our primary end point is uptake of malaria testing defined as the participant's decision to be tested for malaria regardless of the source of the test (CHW or health facility) and the type of test (RDT or microscopy). The primary outcome of interest is the effect of offering a conditional ACT subsidy on uptake of testing when the RDT is free (Group A vs Group B). The secondary outcomes include the effect of RDT subsidy on the uptake of testing (free vs paid RDT, Group B vs Group D), and the effect of a conditional ACT subsidy on uptake of testing when the RDT is not free (Group C vs Group D). Other secondary end points in all four of the study groups included drug purchasing decisions following a positive test, a negative test and with no test. We defined two additional binary end points that combined drug purchasing decisions of test-positives and test-negatives: ‘appropriate ACT use’ was defined as taking ACT if positive or not taking ACT if negative among those who took a malaria tests and ‘targeted ACT use’ was defined as taking ACT if positive or not taking ACT if negative among all participants. All outcomes are based on self-report during the follow-up interview conducted 1 week postenrolment. CHW records and patient records from the health facility were used to confirm the self-reported malaria testing results whenever possible. We calculated the sample size to achieve 90% power to detect a difference in proportions of a prespecified magnitude based on Pearson's χ2 test with a two-sided α of 5% for each of our primary and secondary outcome measures. We estimated that 20% of those randomised to Group D (no subsidy), 40% of Group C (ACT subsidy only), 50% of Group B (RDT subsidy only) and 75% of Group A (ACT and RDT subsidy) would opt in for malaria testing. Of all our outcomes of interest, the secondary outcome of the effect of an ACT subsidy when RDT testing was not free (Group C vs Group D) required the largest sample size at 436 (109 per arm). We intended to recruit a total of 500 participants in order to account for up to 12% loss before the 1-week follow-up visit. In practice, this loss to follow-up was only 2%, thus recruitment ceased at 444 individuals. For the secondary end point of ACT consumption (an individual-level binary outcome) we used the same LPM modelling approach as for the testing-related outcomes. Models were stratified by test results for the subsample of clients who opted for a test. Since the interaction term was not significant in any of these models or in the primary testing outcome models, we excluded it in order to gain power and to improve model interpretation. Similarly, because we had not powered our study for these secondary end points, we reduced the set of prespecified predictors included in the primary outcome to the most parsimonious model with the best fit. To do so, we performed likelihood ratio tests and compared Akaike information criterion for subsets of the prespecified predictors.12 The reduced set included wealth index only. Therefore, we only present the adjustment for the parsimonious model for the secondary end points and provide results from this parsimonious set for the primary outcome for comparison. Since testing outcomes relied on self-reports of testing behaviour, we conducted sensitivity analyses to determine whether model results persisted when the outcome was malaria testing at the CHW only (rather than the broader definition of any malaria test, including those conducted in a health facility) and when there was documented proof of the malaria test. Four hundred and forty-four participants were enrolled across the four groups (figure 1) between 31 July 2014 and 24 June 2015. Overall, 63% were women and 62% were >18 years (table 1). The majority of households owned an insecticide treated net (ITN) (86%) and 63% of patients reported sleeping under the ITN on all the last seven nights. On average, the nearest participating medicine retailer was half a kilometre nearer than the closest health facility (1.6 vs 2.2 km). There was no evidence of differences in patient demographics between the four study groups. Ninety eight per cent of patients had a follow-up interview 1 week after enrolment. There were very low rates of dropouts in all the study groups (2%). Sixty two per cent of participants underwent a malaria diagnostic test for their illness from either source (CHW or health facility, table 2). The proportion receiving a test differed substantially between study groups. After adjusting for the full set of prespecified covariates, the RDT subsidy resulted in an 18.6 percentage point increase (95% CI 5.9 to 31.3; table 3) in the probability of malaria testing over unsubsidised RDTs, in the absence of conditional ACT subsidies. Uptake of malaria testing was not affected by the offer of a conditional ACT subsidy when the RDT was subsidised (Group A vs. Group B, 2.7 percentage points, 95% CI −8.6 to 14.1). 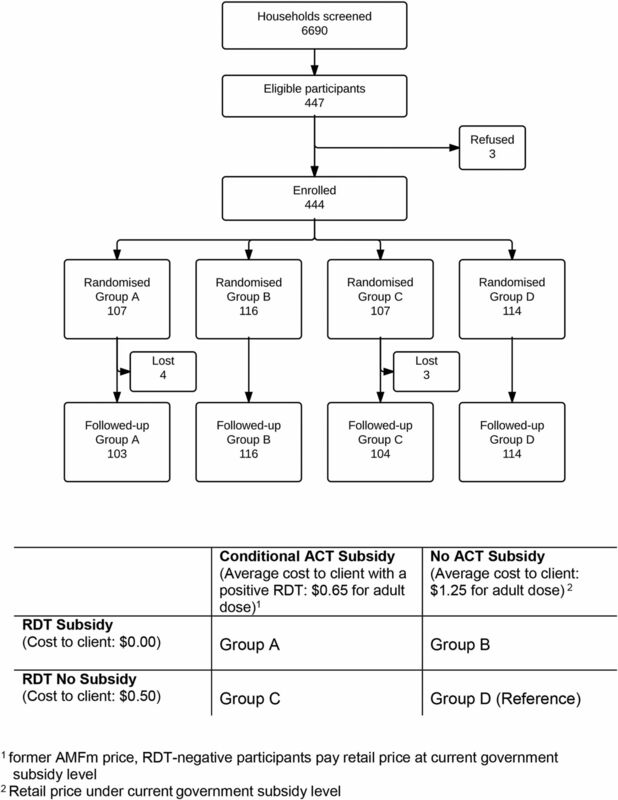 The interaction between RDT and ACT subsidy was not significant in any of the fitted models, indicating that there is no evidence of a statistically significant differential effect of ACT subsidy on the uptake of testing when the RDT test is free versus when the RDT test is not subsidised (see online supplementary table S1). Of those who were tested, 89.9% were tested by a CHW, although this proportion was slightly lower in the groups that had to pay for RDT testing by the CHW (unsubsidised groups) and higher in the subsidised RDT groups (84.1% vs 93.8%, see online supplementary table S2). The difference in proportion of people tested at a facility across the groups was very small, suggesting that the subsidised RDTs were probably not diverting people who would normally be tested at the facility to the CHW testing, although we did not test this formally. The primary analysis is based on self-report; however, the uptake of testing and test results could be confirmed only from records kept by the CHW or by observing facility records in the patients’ possession for 87% of participants. Excluding those without confirmation of testing did not substantively change the estimate of the effect of the RDT subsidy on uptake of testing. Thirty nine per cent of the 267 participants who were tested had a positive malaria result; the proportion was higher in the groups who had to pay for their test (table 2: 45.9% vs 33.8%). Among those who tested positive for malaria, 74.8% took ACT. In the adjusted analysis, malaria-positive participants who received conditional ACT subsidy were 19.5 percentage points more likely to receive recommended ACT treatment, irrespective of whether they received an RDT subsidy (table 4, 95% CI 2.7% to 36.8%). In contrast, there was no evidence of an effect of RDT subsidy on ACT purchasing after a positive test (4.2% more purchasing ACT with the RDT subsidy, 95% CI −1.2% to 20.4%). Among those with a negative malaria test, ACT consumption was lowest in the groups that had to pay for their test. Only 2 of 27 participants (7.4%) with a negative test in the no subsidy group (Group D) took ACT. In contrast, 27.5% of participants in the double subsidy group took ACT following a negative test (table 2). In the adjusted analysis, malaria-negative participants who underwent free RDT testing were 12.8 percentage points more likely to consume ACT (95% CI 1.7 to 23.9; table 4) than those who paid for their RDT. Twenty six per cent of the 163 participants who were not tested took ACT (table 2). ACT consumption among malaria-negative patients was lower than among those not tested in all four study groups (18.9% vs 25.8%; table 2). Appropriate use of ACTs among those who are tested requires malaria-positive individuals to receive ACT and malaria-negative individuals to refrain from taking ACT. Targeting ACT to malaria-infected patients is maximised when all potential malaria fevers are tested and the results of the test are adhered to; patients with a positive test receive ACT and those with a negative test abstain. In our study, appropriate ACT use following a test was highest when clients paid for their RDT and were given a conditional voucher for their ACT (Group C). However, uptake of testing in groups with access to unsubsidised RDTs was low compared to those who received a subsidised RDT. Therefore, overall targeting of ACTs in all participants was highest in the groups that received a free, fully subsidised RDT (42.5% and 39% in Groups C and D, respectively, compared to 56.1% and 57.3% in Groups A and B, respectively, table 2). Consumption of first-line antimalarials has increased, partly due to the availability of subsidised ACTs in the retail sector in many malaria-endemic countries. The vast majority of ACTs paid for in the retail sector are taken presumptively without parasitological confirmation of malaria infection. It is not well understood how to improve the uptake of diagnostic testing among those seeking treatment over-the-counter. In order to maximise targeting of ACTs to confirmed malaria cases, we sought to test whether the RDT should be subsidised and whether ACT subsidy, conditional on a positive RDT test result, could improve appropriate use of ACTs. We find that both the RDT and ACT subsidies in this study had significant positive effects on appropriate fever management, indicating that price is still a major driving force behind these decisions. Fully subsidised RDTs made available in the community greatly improve uptake of testing before treatment. Although making a small payment for an RDT (ie, unsubsidised RDT) seemed to reduce inappropriate ACT use among malaria-negative participants, this benefit was negated by the large reduction in testing rates in the unsubsidised RDT groups. Providing an additional discount on an ACT drug, which is conditional on a positive RDT, improves the use of ACT by those with confirmed infection and increases targeting of ACTs overall. The percentage of malaria infections receiving appropriate treatment was 20 percentage points higher in the ACT subsidy group, suggesting that at the current retail prices, a significant number of malaria-positive individuals would decide not to purchase an ACT even after confirmation that they have malaria. However, the prior offer of a conditional ACT subsidy at the time of enrolment did not improve uptake of testing, regardless of the price of the RDT, indicating that study participants did not project future drug discount in a manner that influenced testing behaviour. We conclude that both subsidies are important, but only in determining the next immediate action. Overall, the randomised design of our study mitigates many concerns about bias. However, there are some limitations that should be considered when interpreting the results. First, it was somewhat difficult to find participants who were feeling ill, but had not yet sought treatment during our door-to-door canvassing. It is possible that the group we identified for enrolment had some systematic differences from the overall population of people who might experience a febrile illness. Second, our results are based on self-report at follow-up, which introduces concerns about recall bias and social desirability bias. Our 1-week follow-up window was short enough to minimise recall bias13 and we were able to confirm testing results by documentation of the test result in nearly 90% of cases. However, we were not able to confirm the drug purchases for most individuals unless they used a study voucher. We note that despite introducing an extra step into the treatment-seeking sequence (CHW and then a shop), uptake of testing was high when the test was offered at no charge to the participant. This possibly reflects the ease of accessing testing through a community member. However, response to the testing intervention may have been motivated partly out of curiosity or desire to interact with a novel experience or opportunity. This may have biased the RDT treatment effect and it may have reduced adherence to the RDT results, which could partially explain the high non-adherence to the RDT in the double subsidy group. It is also possible that information about subsidies offered to other groups influenced individual behaviour. Since it was not possible for participants to be blinded to the intervention (theirs or others'), we are unable to estimate placebo effects or rule out potential behavioural responses to individuals getting information about other treatment arms or subsidy levels. Finally, although our initial group allocation was random, the decision to get tested and the subsequent information received from testing are no longer random due to selection effects. This imbalance across arms subsequent to the first action (whether to get tested or not) could introduce bias in the estimation of treatment effects on ACT consumption. Although we did not observe systematic differences between subgroups (tested or not, those taking ACT or not) it is possible that the groups differ on unobserved characteristics such as preferences or beliefs about their illness or perceptions derived from previous experience with RDTs or ACTs. In previous studies it has been shown that between 36% and 77% of fever treated in the retail sector do not have malaria.14 ,15 A study in Tanzania estimated that 80% of ACTs are sold to patients without parasitaemia and only 70% of parasitaemic patients paid for ACT.16 The discordance between malaria and ACT consumption demonstrates the need for improved targeting of antimalarials sold in the retail sector. Recent studies that introduced RDTs into retail shops alongside subsidised ACTs have had mixed results. A study in Uganda reported low uptake of RDTs by retail shop owners and their customers and low adherence to test results.17 Other studies have demonstrated higher uptake when the tests are highly subsidised and much less expensive than the available ACT.18 There is some tension between motivation of the shop owner to make a profitable drug sale versus the expectation in most studies that an individual with a negative test would not be sold an antimalarial and would be referred to a health facility without a drug. This may even compromise the integrity of the testing; two studies documented high rates of false positives by RDT at the shops compared to a reference blood smear.19 ,20 Offering testing at the community level through agents who are independent of the subsequent drug sale and who are known to the patient may mitigate this concern. Furthermore, in our study, shop participation was high and we encountered no major problems in administering targeted drug subsidies in this manner. We observed fairly high ACT use among untested clients, but not as high as other studies. In reports from other countries where subsidised ACTs are available over-the-counter; between 60% and 100% of untested clients paid for ACTs.19–21 It is possible that the current price of ACTs in the retail sector in Kenya is prohibitive for some families. At the end of the AMFm pilot, the average price of ACT in Kenya was US$0.582 but the subsidy level has declined since the conclusion of the pilot and the current cost of an adult dose is about three times higher than the AMFm subsidised price. In support of this view, we note that our results agree with Cohen et al22 who reported that 25% of untested clients purchasing ACT in Uganda where the price of ACT was four times higher than AMFm target prices.2 Importantly, in all of our study groups, ACT consumption among malaria-negative participants was lower than among untested participants, demonstrating targeting of ACTs as a result of testing. Malaria-negative participants in the double-subsidy group took an ACT more frequently than malaria-negative participants in any other group, and nearly as often as those untested, an observation for which we do not have a satisfying explanation. This is the first study that implements an antimalarial subsidy that is conditional on confirmatory testing. Antimalarial subsidies in the retail sector have improved access to effective treatment but may also increase inappropriate use of the drugs. Confirmatory diagnostic testing for malaria prior to treatment could improve targeting of subsidised ACTs, reducing their unnecessary use and lowering the per patient costs of a subsidy programme. In our study, both RDT subsidy and ACT subsidy (provided conditional on a positive RDT) were independently linked to increases in appropriate fever management decisions, but adding the conditional ACT subsidy on top of the RDT subsidy did not influence the likelihood of malaria testing. We conclude that both subsidies are independently important, but only in relation to decision making on the next immediate treatment action targeted by the subsidy. A drug subsidy which is conditional on confirmatory testing is a promising approach for improving sustainability of publicly funded subsidies. However, more work is required to define the optimal relationship between diagnostic testing and subsidised ACTs sold over-the-counter, both in terms of the level of subsidy of each commodity as well as the mechanism of delivery. This study could not have been carried out without the exceptional attention to detail and commitment of our field team; L Abel, I Khaoya, I Kunusia, E Mukeli, E Nalianya, J Namae, L Nukewa E Wamalwa and A Wekesa. The authors are grateful to the study participants and the community health workers as well as the local community leadership that supported this work.
. Price subsidies, diagnostic tests, and targeting of malaria treatment: evidence from a randomized controlled trial. Am Econ Rev 2015;105:609–45.
. Treatment of fevers prior to introducing rapid diagnostic tests for malaria in registered drug shops in Uganda. Malar J 2013;12:131.
. Clinical trials: a practical guide to design, analysis, and reporting. Remedica, 2006.
. The Use of Discrete Data in PCA: Theory, Simulations and Applications to Socioeconomic Indices. CPC/MEASURE 2004;working paper number. WP-04–85.
. Estimating wealth effects without expenditure data--or tears: an application to educational enrollments in states of India. Demography 2001;38:115–32.
. A new look at the statistical model identification. Autom Control, IEEE Transactions on 1974;19:716–23.
. The impact of recall periods on reported morbidity and health seeking behavior. J Dev Econ 2012;98:76–88.
. Price Subsidies, Diagnostic Tests, and Targeting of Malaria Treatment: Evidence from a Randomized Controlled Trial. National Bureau of Economic Research 2012; working paper 17943.
. Prevalence of malaria parasitemia and medication utilization patterns among clients seeking care for malaria or fever in drug shops in Tanzania, March—May 2012. Annual Meeting of the American Society of Tropical Medicine and Hygiene 2012;abstract.
. Introducing rapid diagnostic tests for malaria to drug shops in Uganda: a cluster-randomized controlled trial. Bull World Health Organ 2015;93:143–51.
. The impact of providing rapid diagnostic malaria tests on fever management in the private retail sector in Ghana: a cluster randomized trial. BMJ 2015;350:h1019. Contributors WPO participated in study design, execution, data analysis, and wrote the first draft of the manuscript. MM participated in study design, execution and data analysis. JL participated in study design and execution. ELT participated in study design, data analysis and drafting of the manuscript. AL participated in study design, study execution and drafting of the manuscript. AP participated in study design, data analysis, and drafting of the manuscript. EM participated in study design and data analysis. DM participated in study design and oversaw execution of study activities. All authors approved the final manuscript. Funding This study received funding from award number R01AI110478 from the National Institute of Allergy and Infectious Diseases of the National Institutes of Health (USA). The content is solely the responsibility of the authors and does not necessarily represent the official views of the National Institute of Allergy and Infectious Diseases or the National Institutes of Health. The study sponsor had no influence on the study design; data collection, analysis or interpretation; content of the manuscript, nor the authors' decision to submit this manuscript. The researchers operated independently from the funder in these matters. All authors had full access to all data and took responsibility for the integrity and accurate analysis of the data. Competing interests All authors have completed the ICMJE uniform disclosure form at http://www.icmje.org/coi_disclosure.pdf and declare: all authors had financial support from the National Institute of Allergy and Infectious Diseases of the National Institutes of Health (USA) for the submitted work; no financial relationships with any organisations that might have an interest in the submitted work in the previous 3 years; no other relationships or activities that could appear to have influenced the submitted work. Ethics approval The study was reviewed and approved by Moi University Institutional Research and Ethics Committee (approval number 0001198) and Duke University Health System Institutional Review Board (Pro00052602). Permission was also sought and granted from the Bungoma East subcounty Health Management Team and the chiefs and assistant chiefs of the participating administrative areas. Informed consent was obtained from all participants prior to their enrolment. Data sharing statement Individual-level data can be requested from the corresponding author. Consent was not obtained for data sharing, but the presented data are anonymised and risk of identification is very low.